An icon and force of nature, Ms. Aretha Franklin, passed away on 16 August, 2018. There have been innumerable comments both thankful and of praise about her voice and music. But I’ve not seen or heard substantial coverage or reference about her role in a politically revolutionary era. A time of upheaval, cultural and social change, violence, and division in which she played a pivotal role. FILE – The Rev. 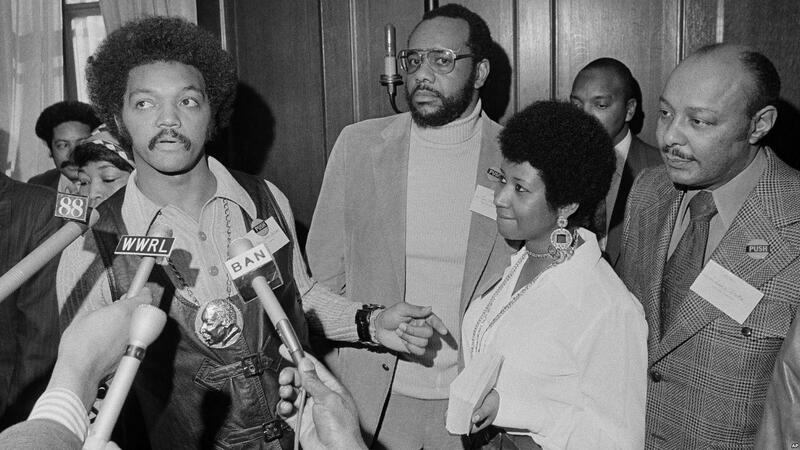 Jesse Jackson speaks to reporters at the Operation PUSH Soul Picnic in New York, March 26, 1972, as Tom Todd, vice president of PUSH, from second left, Aretha Franklin and Louis Stokes look on. FILE – Aretha Franklin appears at a news conference, March 26, 1973. The article from Encyclopedia Britannica lays out her music career in depth and well. It does make a sadly inadequate reference to her greater influence beyond music. Aretha Franklin, in full Aretha Louise Franklin, (born March 25, 1942, Memphis, Tennessee, U.S.—died August 16, 2018, Detroit, Michigan), American singer who defined the golden age of soul music of the 1960s. …“Respect,” her 1967 cover of Otis Redding’s spirited composition, became an anthem operating on personal, sexual, and racial levels. “Think” (1968), which Franklin wrote herself, also had more than one meaning.